Don’t judge me for judging you… but I do judge. I believe everyone should know the beauty of a simple sandwich made with ingredients practically still covered in dirt, smelling of the garden, warm from the sun. I live in the city. The city of Philadelphia, not New York. I do not have the aforementioned garden. But lots of other people do, and they bring me that beautiful produce. When I build a recipe, I always think first and foremost about what items are at the peak of their season just then and there. However, I also believe in buying the best of imported products now and again. There is one brand of olive oil I used to buy in Florence, Italy when I lived there for a year, and I would just die to get some on my hands now. Until I can sneak away for a weekend of delicious Tuscan food and pack my suitcase with cloudy pressed Florentine olive oil, I settle for the imports at my local market. For the basil, I simply pick some from the pot on my windowsill (which is still alive after a few weeks) or buy the most vibrant bunch I can find at my local farm market. You’ll know it’s good if the smell of home instantly fills your kitchen upon unpacking the bunch. At least, that is what it smells like in my house. Tomatoes are so easy at this time of year. I prefer the ugliest tomatoes I can find, knowing that they will be passed on by even though they are the tastiest. They are hearty and almost meaty and I love to eat them like apples, sprinkled with salt. For this panino, I like to cut big thick slices and let a bit of the juice drain off so they don’t make the bread soggy. 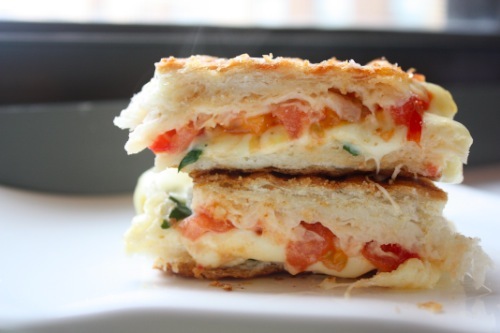 Speaking of the word panino, it is panino, not panini, and I judge because of that. I don’t know where the crazy started, but it should be paninO for singular and paninI for plural. I don’t know why this bugs me so much, but it does. It annoys me almost as much as hearing Giada say “Mozzarelllllla” with her strong Italian accent in the middle of an English sentence. When it comes time to select your cheese, try and find a local dairy farm. My Whole Foods carries the most delicate local mozzarella that just melts in your mouth, and when they have stock I usually buy more than one container. 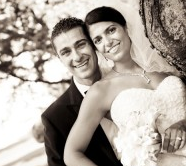 DiBruno’s also makes some in house that will make you think you’re in Italy. After you have all of those ingredients, all you are missing is the bread. Go for the best! I like to use fresh ciabatta bread, but use the best option your local bakery has. When you buy the highest quality ingredients, you can get away with making a panino for a guest. You can also get away with calling the simple list below a recipe. Preheat a panino maker or grill pan. Layer 2 pieces of the ciabatta bread with the summer tomatoes, basil and mozzarella. Sprinkle a dash of salt over each piece. Cover each with the second piece of bread and brush the outside of each sandwich with olive oil. When the grill pan or panini maker is hot, add the sandwiches and grill until the cheese is nice and melty and the bread is crunchy. Enjoy! This is definitely one of my favorite late summer meals. Yours? oh, I am SO with you on Giada over – enunciating !! It’s crazy. one of my very favorite sandwiches or salads is the caprese… especially grilled. so delicious, and yours looks gorgeous. as for the sandwich, it really couldn’t be more beautiful. it’s truly all about the freshest of ingredients! One of my favorite combos. So fresh, so good! Interesting about the singular/plural…regardless- I want one 🙂 Favorite summer meal- panzanella. So good! anything involving fresh pesto for us! @Holly B, Thank you so much! That is such a sweet compliment!!!!! My favorite! My mouth is literally watering! At Napa Valley Grille they had this grilled vegetable sandwich that had grilled portobello mushrooms and zucchini with fresh mozzarella, baby arugula, a basil oil, and balsamic reduction. I think I had it 12 days in a row one time. I think simple recipes done wonderfully are the best way to go! 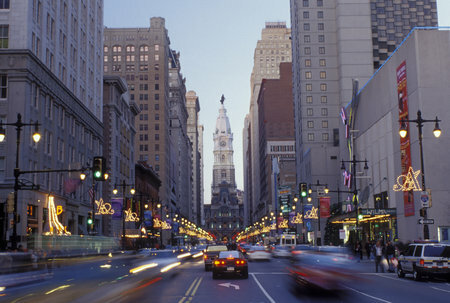 Love that pic of Broad St! @Laury @thefitnessdish, Thanks!!! Hi Philly girl!!!! Would you believe I have still never had a proper Jersey tomato? I have only lived here a year, but still… I need some Jersey tomatoes asap! All of mine have come from PA this year! Haha. I ALSO get annoyed when people misuse foreign words–and I always say panino. People love to correct me… then I correct them. I love these would order them for lunch all the time when I worked at wild oats. I love my panini maker, it gets lots of use. My nana always though the Italian olive oil was the best till her friend started bring her the greek olive oil, from greece now we only buy the greek it has a great flavor. Ah, please don’t judge me, but I am not as careful and prudent as you are in choosing my ingredients. as a college student in downtown LA without a car, I am so limited to the cheap produce they sell in the local Latino supermarket, which has questionable produce at best. I wish I could be more local, and I do try to eat seasonable, but until I start earning my own money, I have to stick with the cheapest I can find, which in most cases isn’t local. But I do totally agree with you that local produce is superior in taste, ethics, and quality. @sophia, I think everyone can do the best they can… as a college student without a car, you do REALLY well eating lots of veggies! Are you going to the Foodbuzz Festival again this year? I hope to see you there! By the way, LOVING your comment plug-in. Which do you use? @sophia, Thanks! It is an option in the “WP Thread Comment” plugin! your picture makes me miss philly so much! I used to walk on market st. every day to get to and from work. oh memories. As much as the center city to manayunk commute was a pain every day, being able to enjoy center city and all that it has to offer was great! I love tomatoes! One of my favorite things to eat is just a tomato with salt in the summer. Classically, that is my favorite sandwich, too but I haven’t gotten it in some time. I will have to make it soon! That looks so good and so pretty, perfect for summer and for maybe a party. I wish I only got perturbed about people using foreign words incorrectly… has anyone noticed how bad English has gotten lately? I go blind at the misuse of apostrophes daily… but all my aggravation has melted away at the thought of caprese–yum! The following time I learn a weblog, I hope that it doesnt disappoint me as much as this one. I mean, I do know it was my choice to learn, but I actually thought youd have something interesting to say. All I hear is a bunch of whining about something that you would fix in the event you werent too busy in search of attention.